150 Brilliant LED lights – 150 LED bulbs on 50ft high quality copper wire, produce a cozy, warm white color, which enable you to decorate a beautiful and fairy world. Ideal for decorating your gardens, patio, lawn, porch, gate, yard, Christmas lights, wedding, party etc. 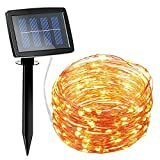 High Quality & Flexible Copper Wire – Solar powered string lights(low voltage, no transformer included), made with thin and flexible copper wire, coiled with bobbin winder to avoid a mess, the string lights is easy to storage and ready for the next use. Also, it is environmental- friendly, high energy conversion rate, durable and safe to use. Water Resistant – Both the string lights and the solar panel are IP65 Waterproof. No worry to use them in the rain. AMIR® 150 LED 50ft Solar Powered String Lights(low voltage, no transformer included), bring you into a wonderful and magical fairy world! They’re tiny and easy to install. 50 feet in length makes it easy to arrange the lighting chain either by single strands or in bunches. Solar powered and built in rechargeable battery make it environmental friendly. Two automatic switches enable you to leave it alone without turning on or off. It will auto on at dusk. Ideal for decorating your gardens, patio, lawn, porch, gate, yard, Christmas lights, wedding, party etc. ▲ Please note that the string light won’t light up in bright place. ▲ To turn on the string light in the daytime, please fully cover the solar panel and make sure that no light source or sunshine exposure.